Markets have continued to drift upwards, and the S&P 500 has now reached the 1500 level, reaching the target we set a while back. How much is left in the tank here? We may find out soon. A lunar Green period is about to start this week, and I think the market will use that to test how high it can go (for now). 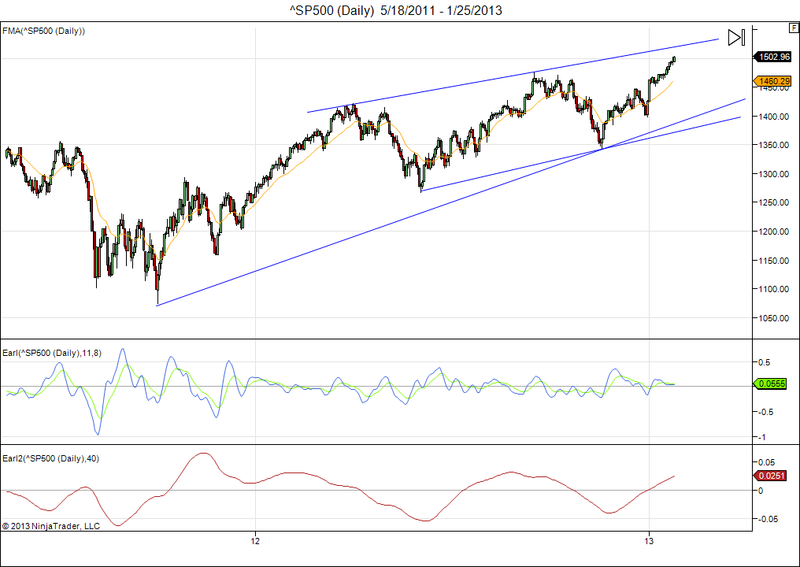 We can see that there is more room to rise, but resistance from the overhead trendline can be expected around 1520. My Earl2 momentum indicator is still rising nicely, but starting to look rather extended. Meanwhile the shorter term Earl is showing some weakness already by not confirming the market top. I think the market will continue to push into the 1520 level, at least into February and maybe even into a March double top, but then we are going to get an inevitable pullback. If we do push above 1520, then I would look for a peak in March where the all time high in the S&P 500 and in the Dow Jones Industrials gets tested. By the time my Earl2 indicator starts topping out, we should be reducing bullish positions. You will hear about it on this blog. I am almost ready with my Four Pillars Finance forecasts for 2013. Last year’s forecasts have panned out quite well. This entry was posted on January 28, 2013 at 2:29 pm	and is filed under Market Commentary. Tagged: Dow Jones Industrial Average, financial astrology, S&P 500. You can follow any responses to this entry through the RSS 2.0 feed. You can leave a response, or trackback from your own site. thank you for sharing four pillar financial report to us. i was reading page 2nd of the report where you mentioned s&p reaching 1460 do i read that right or it should be 1560 i was not trying to be smart just wanted to make sure because if you hear CNBC and think market might go to somewhere over 1600 s&p points which i believe too much undue exuberance???? Where the 1460 comes from was explained in more detail in last year’s forecasts ( http://fourpillars.net/finance/pdf/year2012.pdf ). Basically, it is the projecting out of S&P 500 targets based on the assumption that we are in a strong decade. Since we started in 2010 with the S&P at 1115, that would give us 1460 by the end of 2013. So, that’s where it comes from. I know this looks crazy, but it already looks a bit less crazy now with the S&P at 1500 already. Basically, the market could stay flat for the rest of the year, and it would still be in line with this strong decade projection. But let’s not forget that governments around the world are printing money (QE) to “stimulate” the economy. If that turns out to be the case, then bond investors will have lost half of their wealth, while stock investors will just break even on a purchasing power basis (and that with the S&P above 2000).